Cryotherapy facials uses pressurized liquid nitrogen vapors applied to the face and neck to stimulate the production of collagen and decrease pore size. Skin becomes tighter, more even-toned with improved blood circulation. Over time, skin becomes more elastic due to the increase in collagen. The anti-inflammatory responses of the body to cryotherapy are also an effective means to treat chronic skin conditions such as Psoriasis, Dermatitis, and Eczema. *If you’ve recently had fillers, we recommend waiting 2 weeks before you have a CryoFacial as to not disturb the injectables. At Cryo Philadelphia, we are including professional esthetic services with our traditional Cryofacial and all new pioneering LED phototherapy for the ultimate service for skin tone, collagen production and glow! We use only Intelligent Nutrients, certified organic health and beauty products. Your service will begin with a deep cleanse and exfoliation with Purifying Cleansing gel, Skin Refining Polish and Glycolic Gel. Next we will tone your skin with the Purifying toner and prep you for the relaxing LED treatment with the Renewal Complex Serum. 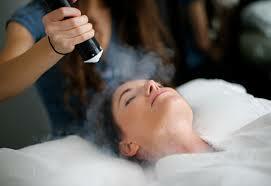 To wrap up your experience, you will receive a Cryofacial. Oh wait! Before you leave, you will also be treated with an Eye Treatment and Restorative Moisturizing Emulsion. Now go on with your gorgeous self!